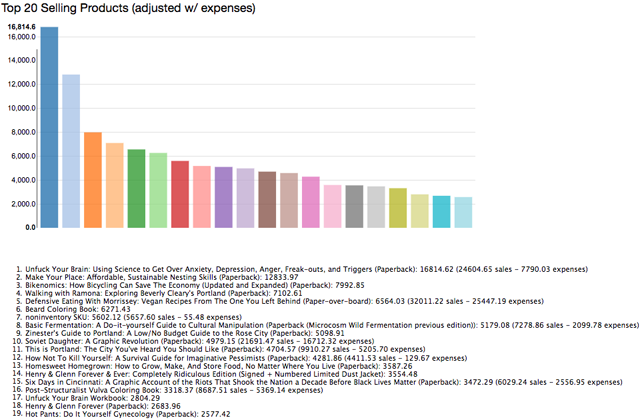 It’s been 12 months since we reported that 2014 was Microcosm’s best year ever (and not just financially). Well, we are stoked (and relieved) to report that 2015 was even better than that. 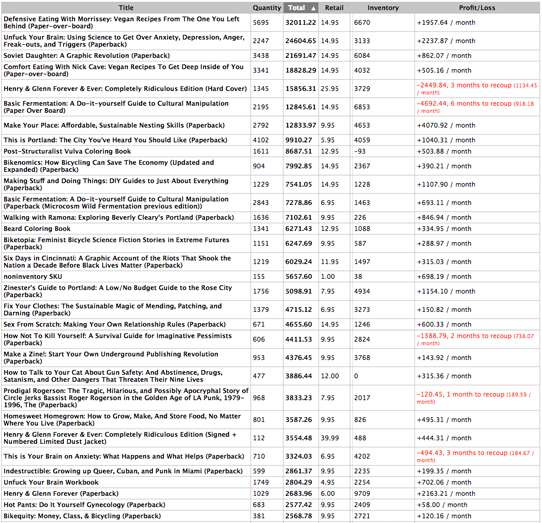 Since last January 1, we’ve published 14 books, a box set, and a documentary DVD. We have even more than that lined up for 2016, and our production schedule is full through 2018! This year is a big deal for us in part because it’s the year we got *ahead*—that means that most of the next two years’ books are at a stage where almost nothing will ever have to happen again in a frenzied, typo-laden, overwhelmed rush. We can’t wait to show you what’s coming out next. We had some big staff changes this year. Tim moved back to sunny LA, and our editor Taylor stepped up to fill his shoes as publicity manager. Erik sallied forth to open a bar/coffeeshop and Thea joined us to direct our sales efforts, and we also hired Cyn (interview coming soon!) to help get our books in more stores. In addition, we participated in 20 events and 3 author tours (our annual Dinner and Bikes tour, Bob Suren’s Crate Digger tour (actually 2 tours) and Dawson Barrett’s two-part Teenage Rebels tour). It’s more complicated than it seems like it ought to be to calculate how many books we sold, but our best estimate is that we sold about 120,000 books last year; that’s 328 books a day! No wonder we’re all a little tired. 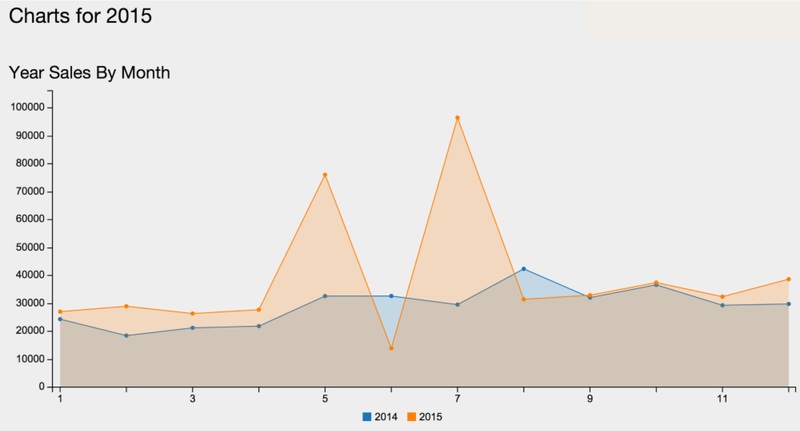 Our total income for the year was $468,733.33 (a 21% increase from 2014). 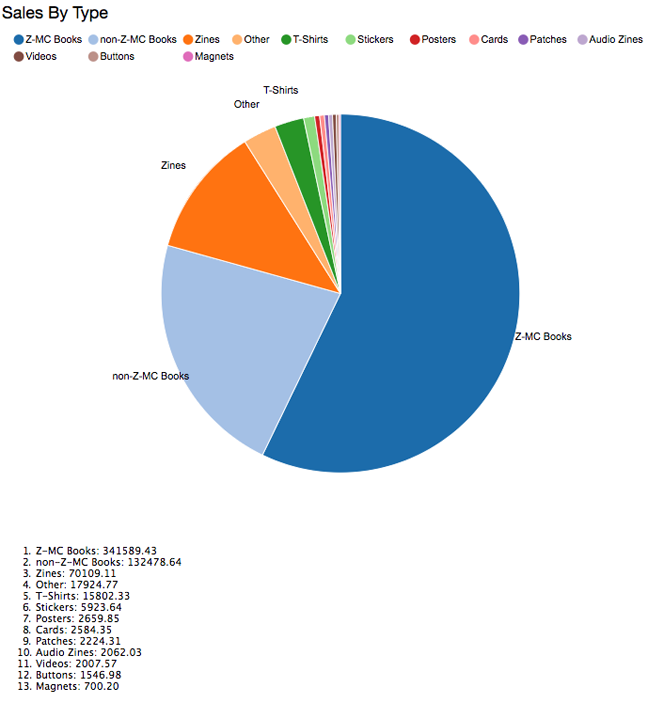 Here’s a pie chart that shows where that came from. 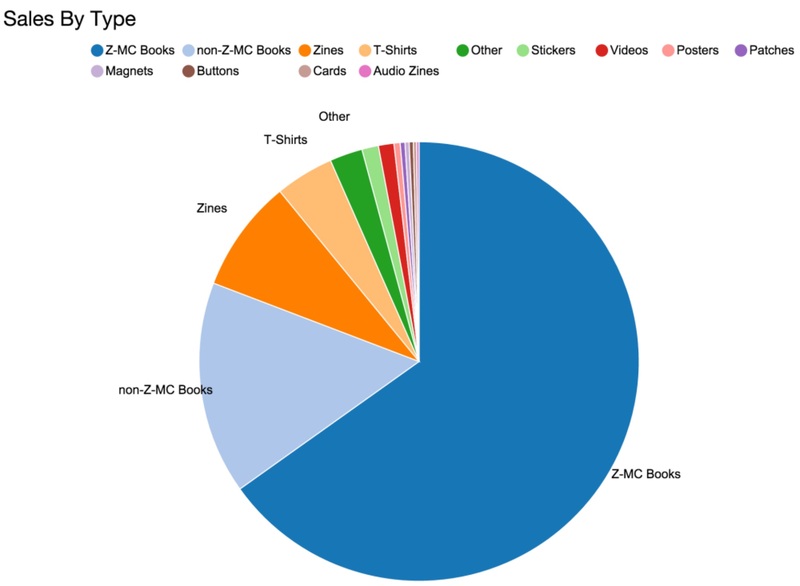 “Z-MC books” means books that we published, whereas “non-Z-MC books” means books we distribute from other publishers. “Other” is mostly the ever-popular Slingshot planners. And here are our expenses. 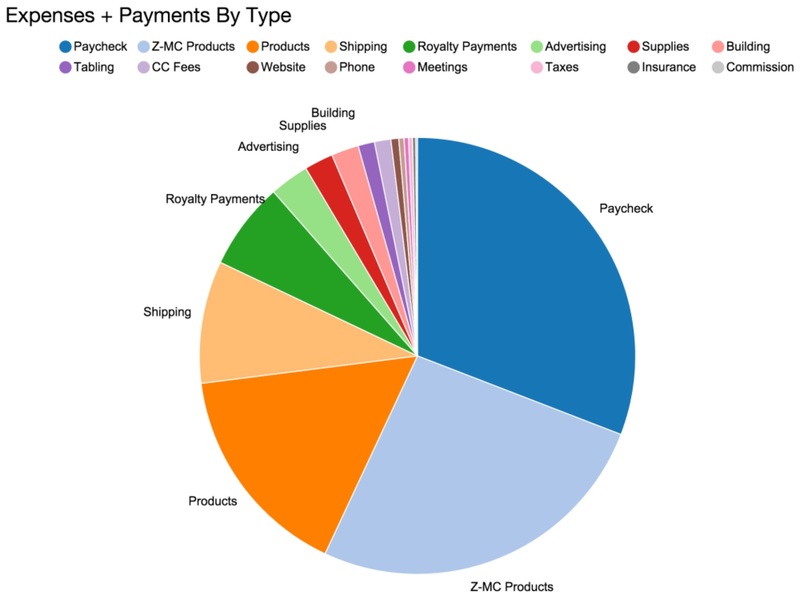 “Z-MC Products” are printing costs for our published books; just plain “Products” includes other publishers’ books that we distribute, blank t-shirts and t-shirt printing, patches, stickers—the cost of any goods we sell. Among other revelations amongst these numbers, we paid more in wages this year than we did to our printer. That’s a first! A reminder of how we work: While we’re technically set up as a “for-profit” company, we choose to operate on a break-even basis. This means that any time we manage to out-earn our expenses (which we try very hard to do), we put that money back into the company, usually in the form of staff wages and publishing more books—basically everything that went up this year. The publishing industry doesn’t have a lot of extra money floating around, but by taking data and math into consideration in every decision, we’ve carved out a little place in it where we can publish the books that matter most to us and keep them priced affordably. Thanks for being along for the ride! We’ll be saying this a lot in the next few months, but 2016 is our 20th year of publishing, and we come to work every day excited that we still get to do this—so thank you for being part of making it work. We can’t wait for the next 20! In the meantime, if you’d like to give us a little boost *and* get 25 books for $50, consider backing our Kickstarter now through January 28th! Elly here, your new Microcosm marketing director. Starting today, I’ll be working at pretty much every level to get all our books into the right hands, and also to continue publishing my line of feminist books about bicycling and getting new editions ready of the two books I wrote for Microcosm. I’m stoked. 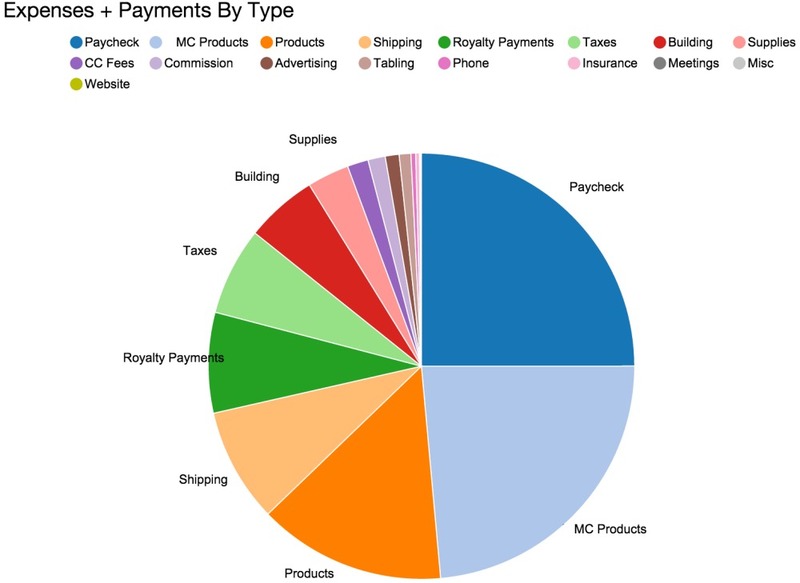 My first post here at ye olde blogifesto is about everyone’s favorite topic: accounting! Starting in 2009, we’ve published our finances at the beginning of every year. It’s helped both us and our fans keep tabs on how and what the company is doing. We’re proud to be able to be this transparent. We’re also proud (and exhausted, and relieved) that 2014 was our best year EVER by every metric that matters to us. Before I start bombarding you with numbers, a quick note on how Microcosm works. We operate on a break-even basis, which means: No profits. That is to say, if we are lucky and industrious enough to earn more than our expenses in any given year, that money *does not* get split between owners or shareholders. Instead, it gets put back into the business. Staff get raises and we get to hire more people and we get to take a chance on publishing more books that we love. Also, more sales = more income for the people we work with. Authors get bigger royalty checks, and people whose books we distribute get to sell more books. In short, everyone wins. All of this happened in 2014 and 2015 is looking pretty great already. In short, we spent a lot more on existing staff wages and hiring rad new people, a whole lot more on books that we distributed, and a whole heck of a lot more on our office/store/warehouse (we bought a building!). We spent more on travel to sell books and speak at various events, we donated more books to causes and organizations that we support. We paid out twice as much in author royalties as we did in 2013, even though we spent considerably less money publishing (and advertising) books. And we came out a little ahead, which gives us a buffer for the first few days of whatever 2015 brings. We had a tough few years back there, but I’d say we’ve (finally!) officially bounced back. We’ve paid off all of our debts (and some other people’s too) and everyone’s getting paid regularly, on time, and more than ever (that’s the flip side of owners not splitting profits—when the company loses money it comes out of owners’ paychecks and savings accounts and credit lines—but now we’re looking only forward). 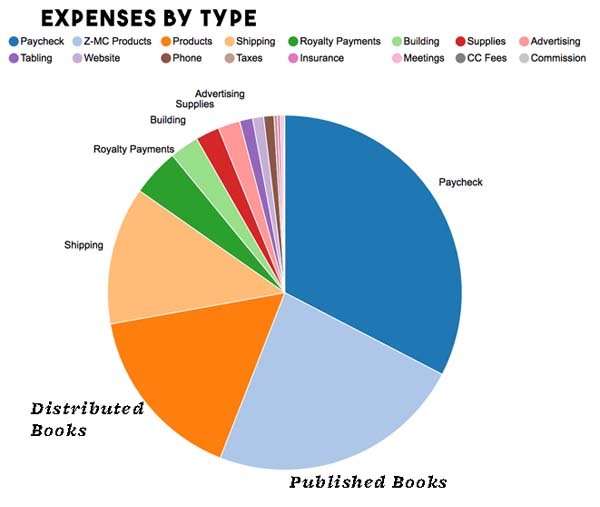 As you can see, print isn’t dead—we’re finding that when we go about it thoughtfully and well, publishing books still makes a lot of financial sense. Unfortunately, there’s a ton of mythology going around to the contrary. I’m sure you’ve heard about the great benefits to authors of self-publishing through a certain giant online retailer. I mean, Amazon will give you a 70% royalty on your ebook! Who can compete with that? But with all respect, it’s smoke and mirrors. Amazon loves to pit authors (and readers) against what it paints as the greed and ineptitude of publishers—but often people optimistically forget to notice that Amazon is the biggest, most greedy publisher of all. 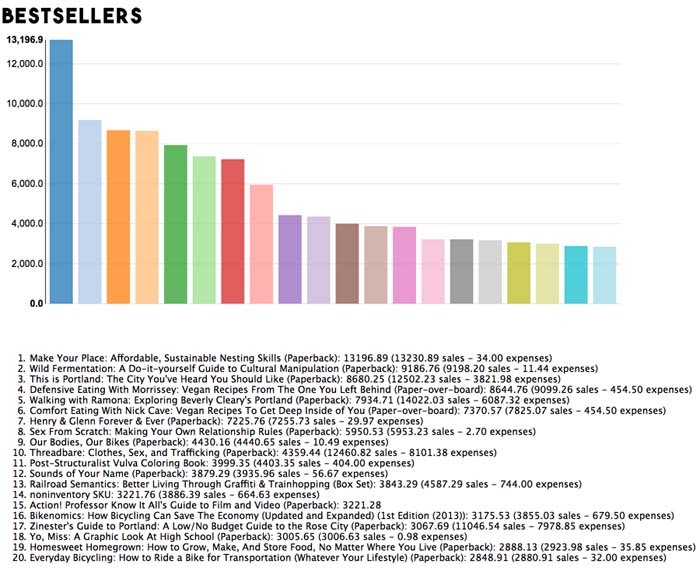 We’re still shaking our heads at this 2012 Guardian article breaking down author royalties from Amazon. 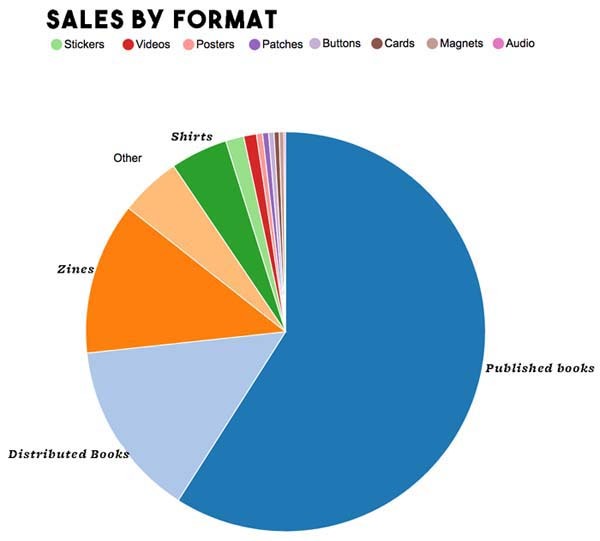 In terms of self-publishing, it’s still way way better to skip the e-books and print on demand and do it in large runs of offset print books—as this breakdown by Joe on my blog earlier this year shows—essentially launching a traditional publishing company. For those disinclined to do so, working with an actual publisher still makes a ton of sense. Ideally, the author-publisher relationship should be a symbiotic one, sharing the hard work of making good books and getting them into the hands of readers who will value them. That’s our goal, and we’re always working to do it better. So there’s that. Thanks for reading, for cheering us on, for keeping us honest, writing us love letters, submitting your work, and for being a part of this community. We’re stoked about what the next year will bring. Next month we turn 19, so a year from now there will be even more celebrations in store. As well as more pie charts, of course. In the name of fiscal transparency, like a 501(c)3 nonprofit, we publish our financial reports each year. You can also read them from 2012, 2011, 2010, and 2009! We’ve worked very hard this year, one of our hardest ever, and we have a lot to show for it. We were able to re-institute a year end bonus for all employees while giving raises and paying off all of our old debts. We feel that we have reached a place of stability with a certain future through the recession and the evolving publishing industry. We moved into a newer, larger building last month that we own. Thanks for all of your support and for sticking with us through our 18th year. All future finances beyond operating expenses will go into upgrading computers, providing raises, and re-instating staff healthcare. If you want to help, the best thing you can do for us is to sign up for a BFF subscription or purchase anything from the site! We used this profit to pay off last year’s losses of $-967.87 and establish a bit of a safety net for the future. 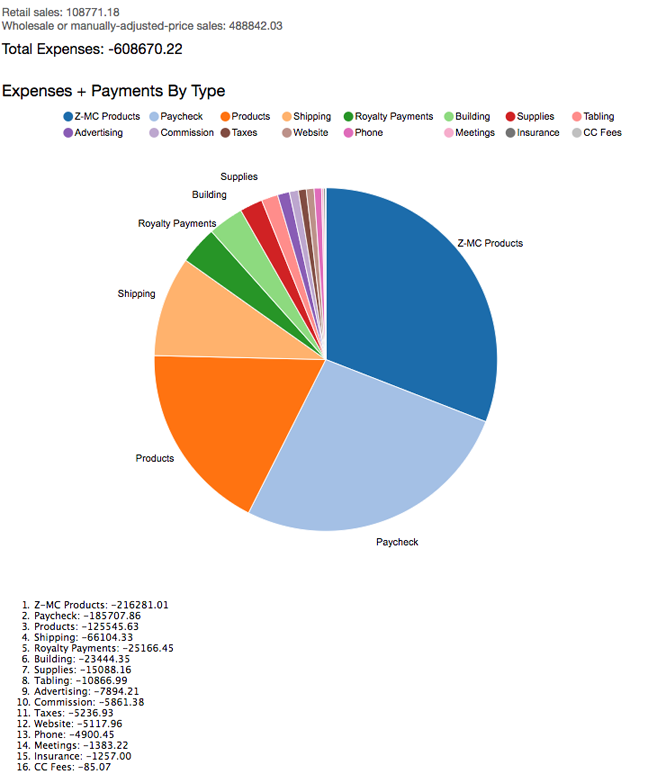 In the name of fiscal transparency, here’s our 2012 financial report! You can read them from 2011, 2010, and 2009 too! We’ve made a lot of headway this year and feel like we are approaching a good place despite a recession and changing publishing industry. We’ve resolved a tremendous amount of old debt so big thanks and hugs to everybody who stuck with us this year. We are still working on re-instating last year’s reduced wages and healthcare but we are finding creative ways to work out those problems by next October. Here’s a toast to continued improvements in 2013! If you want to help, it is always helpful to sign up for a BFF subscription or purchase anything from the site!